Sweet Confusion is a conference project that intends to investigate the artistic and historical processes of two countries that remain in the ‘peripheries’. 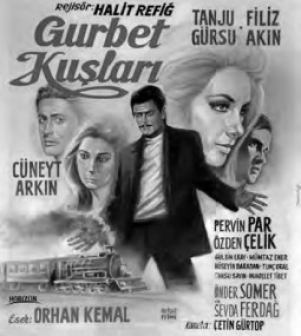 The conference will explore Armenian and Turkish cinematography of the 60s; by doing so, it is attempting to reread the social-political and cultural paradigms of two geopolitically estranged situations, which throughout 1960s were in the process of self-defining and self-positioning by determining and shaping the ‘Other’ through a complex correlation of cultural and political systems. in China and Latin America), in making a comparative analysis and contextualizing the historical developments in the arts, culture and the societies of the 60s and the 70s, and researching their subsequent effects on contemporary social, political and cultural situations. 11.00 Screening Birds of Exile, 93 mins. 13.00 Screening Hello, its Me, 137 mins. 15.30 Screening One Night Bride, 77 mins. 11.00 Screening My Prostitute Love, 90 mins. 13.00 Screening Daddy, 76 mins. 15.00 Screening Bitter Life, 96 mins.